I am sharing my thoughts as a part of the Superb Writers’ Blogathon. In partnership with Grammarly grammar checker, this series is bringing helpful hints to aspiring writers. February at Literacy Launchpad has been author study month! We’ve been reading all the Mo Willems we can get our hands on, and thinking like authors ourselves! I’m sure it’s not news to any of you reading this that reading and writing skills are linked. But as an early childhood educator, I have a tendency to lean much more heavily into the reading side of literacy when I’m teaching. I really need to be giving proper attention to writing as well. Read! - We’ve all heard this over and over: if you want to be a good writer, you must read plenty of books. All kinds of books! For preschool writers: Read books with your little kiddos through the eyes of a writer. Before, during, and after you read a book, wonder aloud about why the author might have written it, things you like about the story, or how you might have written the ending differently. Find a writing space - Have a place to work that allows you to focus, while also fostering your creativity. 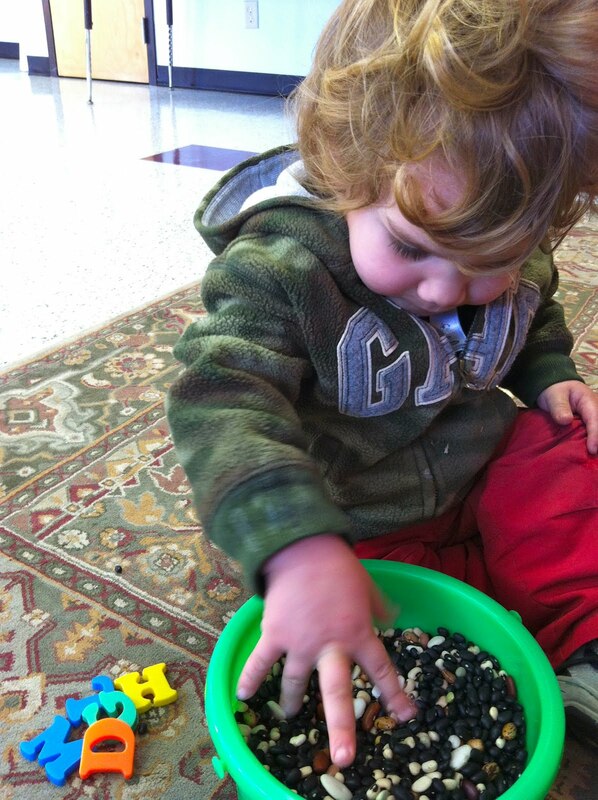 For preschool writers: Create a writing center for them. Need some inspiration and ideas for a writing center? Look HERE! Look for Ideas - Carry a notebook or pad with you at all times and jot your ideas down as they pop into your head. Ask yourself “what-if” questions to get the juices flowing. Become an observer of the people and places that surround you each day; take notes, notice details. For preschool writers: My preschooler has been coming up with all kinds of ideas for stories lately and it all started with me simply suggesting we make a book about some silly little thing that happened one day. Now he sees story ideas everywhere! I really need to get a notepad to write these down on - more writing modeling and practicing! Make sure you have solid structure to all the elements of your story: good beginning and end, interesting characters, plenty of action (things happening). Practice! Practice! - The only way to get better at something is to do it lots and lots. Write everyday! What they say is true: practice makes perfect! For preschool writers: I think I have mentioned before an idea I saw once about instituting a “Read O’Clock” time at your house each day? Perhaps there could be a Write O’Clock time too? Even to just have writing materials always readily available to your child is extremely valuable in fostering those early literacy skills. Go to the office supply store and buy some irresistible writing tools; think of all those fun office supplies they always want to play with at your office! Rewrite - Keep working, and working, and working your story/article/poem till it’s right. For preschool writers: Little kids have little attention spans. 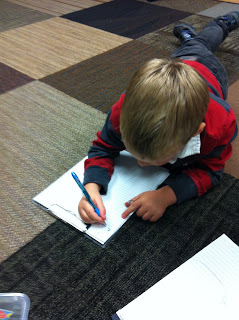 Let your child start a story in their writing center one day, and then come back to work on it more another day. Perhaps have a blank book that they complete a page in each day, or each week. Do some journaling! 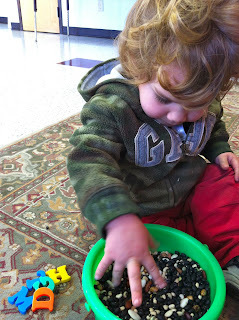 Let them revise and make changes as they please (we all know how fickle preschoolers can sometimes be). Just let them have fun with it! For preschool writers: As a parent or teacher, model new vocabulary for them. Point out the descriptive words in the books you read. If they are “writing” a story with you, ask them questions about what they dictate to you (“What color was the dress she was wearing?”) and add those details to the text of their story. Letting your child draw illustrations for a book, and then describe his pictures to you as you write in the text. 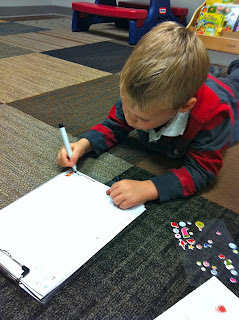 Letting your child practice tracing letters, or engage in some other kind of basic, tactile activity to practice writing their letters. Letting them scribble to their hearts delight - that’s how writing begins! 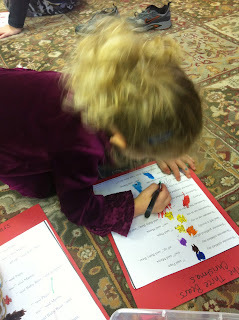 Children can (and should) be practicing their pre-writing skills right along with practicing their pre-reading skills. Click HERE to check out some picture books about writing! Use these FREE word bubble printables to add some extra fun to your writing center! *What books did I use from the library? So glad you asked! 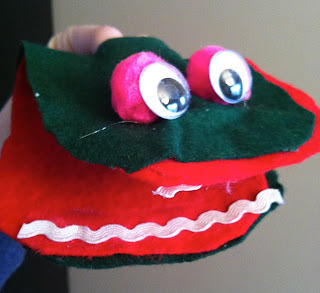 My Library's Storytime Can Beat Up Your Library's Storytime! Our local children's librarian has really devoted a lot attention to making her preschool storytime GREAT! Attendance seems to be increasing every week (from what I can tell). Lately, your lucky if you can find a spot to sit if you're even a little late. I have visited my fair share of storytimes that were duds. So to have such an amazing children's librarian in our small town here is a blessing! She always chooses great themes and her after-story-projects are so much fun! When it's time for craft My Little Reader and I go sprinting for a coveted spot at a table, and our lovely librarian is often scrambling to cut extra craft pieces out to meet the ever increasing demand. A great problem to have! Today's storytime theme was alligators. Meaningful Literacy Experiences - Winter Style! This horse is wishing for a "hat" like Hedgie's. He can find one on the clothesline! Hedgie laughs and says, "Don't they know that animals should never wear clothes?" Predicting (our focus during the month of January) what snowman accessories are hidden under the sheet. 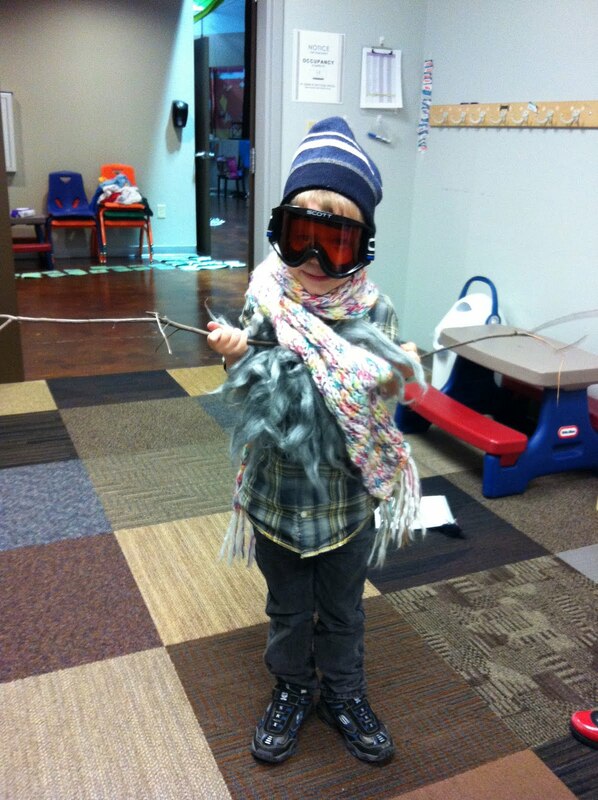 ... Then dressing up like silly snowmen! Writing a letter for The Jolly Christmas Postman (Allen and Janet Ahlberg) to deliver! Enjoying some good books by the fire during the month of December. I can read with my rebus reader! 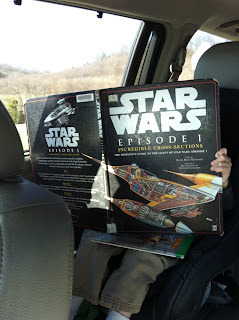 When I talk with the parents of potential students, many of them want to know how I'm going to teach their preschooler to read. 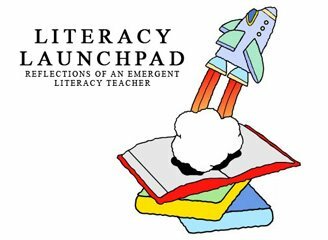 But teaching a preschooler how to read is not the mission of Literacy Launchpad. True, it is sometimes a happy by-product of what happens in class. But the core mission of Literacy Launchpad is to motivate and empower children to soar into reading. What do I mean by motivate and empower? To motivate someone is to provide them with motivation, a need or desire to act. In this case, we're providing motivation to read, or to be read to. The empowerment part is where we strive to give them the pre-reading skills that have been shown to be necessary to learning to read (vocab, phonological awareness, narrative or sequencing skills, print awareness, letter knowledge, and motivation). Literacy Launchpad gives children a weekly dose of fun with books (motivation), whilst teaching basic pre-reading skills that empowers them with what they need to learn how to read when they head into kindergarten. As a child, though I was a good reader, I was not an avid reader and had a lack of motivation in that area. I love to read now. But looking back, I wish more of a motivation had been instilled in me earlier in life. And that's a big part of why I wanted to begin a program like Literacy Launchpad. Recently though, I have seen the reason why motivation is so important really come alive for me. I have two school age children now that are eleven and eight years old. They have only been in our family for a little over a year now, and didn't have much (if any) schooling prior to coming to America. In fact, I would venture to say that they were never read to as children, and probably didn't even have much exposure to books. Now for some children that come from this kind of a background, this develops a healthy appetite and respect for books and knowledge. Once they have access to what they have long been denied, they gobble it up. But this is not the case for every child with this kind of history. My older children are struggling to learn to read, and it appears that motivation is the biggest hindrance to their learning. They don't see the value in reading. They have never experienced the joy, or seen others experience the joy of books. They have made it this long without knowing how to read, so why learn now? Couple that with feelings of inferiority and shame when they see how far ahead other children their age are in reading, and you end up with a big ole case of I-Don't-Wanna. When I came home from a recent vacation with my hubby, my children were totally befuddled by photos of me lounging with books and reading. They didn't understand why somebody would be reading while on vacation. I didn't understand this befuddlement, as they see me reading frequently at home; it is obviously something I enjoy doing. But they still seem to see it as something you only do if you have to. I had to explain that people love to spend time reading, especially on vacations, and that many other vacationers were reading as well (not just me). This is normal! People read because they want to read, because they enjoy it. This was news to them. My children had no Literacy Launchpad in their preschool years. They had nobody reading and cuddling with them. They had nobody taking them to the library. They had no teachers sharing and talking about their favorite books with them. They didn't have a house full of books. They didn't see adults around them reading. They now have all those things in spades. But their early childhood deprivation has led to a serious lack of current motivation. And a lack of motivation can make learning to read, an already challenging task for ELL children, nearly impossible. We continue to plug away at reading here in our home. But seeing my children's struggle has further affirmed me in my Literacy Launchpad mission. I can't change the past for my children, but I can be a part of changing their future, and I can continue equipping all my Literacy Launchpad students for a future full reading success! !